The NF 2 night fighter, first flew on 22 August 1950 and entered service in 1953, having been delayed after some minor problems with the type. To accommodate the necessary two man crew (pilot and navigator/radar operator) it was structurally different – the two crew were positioned side-by-side and an airborne interception radar was fitted in the nose. It replaced the Vampire NF 10, and was followed by NF 3, which was the last night fighter variant of the Venom, first flying in 1953 and entering service in 1955. It had a relatively brief career with the Royal Air Force, having been only an interim solution, and was withdrawn in 1957 and replaced by the Gloster Javelin twin-engined all-weather fighter. 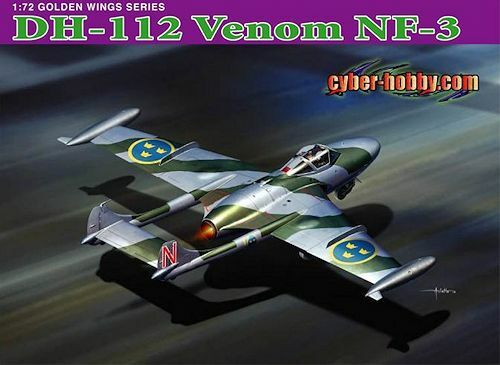 It was not surprising to hear that Cyber-hobby was releasing an RAF Venom. They already had some of the parts done when making their earlier Sea Venom and Vampire kits, so the conversion process to the land based Venom allowed them to use the Sea Venom sprues in this new kit. 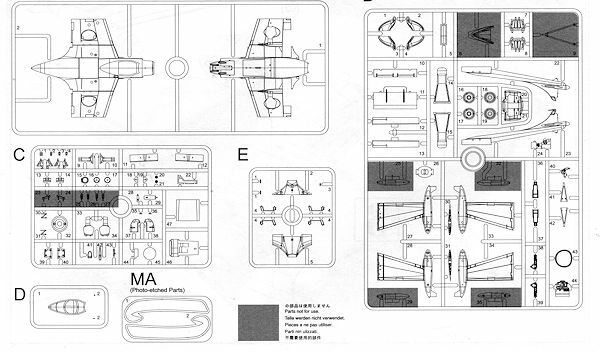 Of course, there is a new sprue that includes a new aft fuselage section and new rocket rails. Like the previous kit, there is a nicely done cockpit and the kit does keep the wing fold parts, only this time, you are to build the kit with the wings straight as the Venom had fixed wings. I would suggest gluing t he wing sections to the upper and lower fuselage halves rather than attaching them later. This should ensure no step where the outer wing sections join. A small photo etch fret contains the prominent wing fences. This kit will also need a lot of nose weight to keep from tail sitting and while no amount is provided, I'd just put in as much as you can. The short landing gear should hold up just fine. The kit includes the one-piece canopy of the earlier Sea Venom. There will be some holes to fill and a few to open as well. The biggest additional work will be in cutting off the old rear fuselage sections that are for the Sea Venom to allow you to use the NF.3 tail section. All of these actions are clearly shown in the instructions. As with the earlier kit, you get a complete engine and intake assembly to trap between the fuselage halves. This additional weight aft of the main gear is all the more rea son to really pack in the nose weight. The kit provides separate elevators and ailerons, but they are designed to be installed in the neutral position. The option is provided to do a gear up plane, though you will have to come up with your own stand. Instructions are well done with Gunze and Model Master paint references. Both options are painted in the standard green/grey as used by the RAF in the 1950s. The box art option uses the upper side grey for the underside, just like late war Mosquito night fighters. This is a plane of F1 Wing in Sweden during 1959. The other is an RAF plane of 125 squadron in 1956. 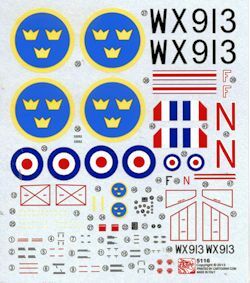 The decals are nicely done and include a bevy of stencils. There have been aftermarket sheets that include the Venom NF if you look a bit for them. Like all Cyber-hobby kits, this one is quite nice. I have no doubt that they will produce the rest of the Venom family in the fullness of time, along with perhaps other versions of the Vampire as they now have pretty much all the major bits and only need to add in those parts that are unique to the variant being boxed.